The state paralympic badminton athletes gesture in a photo-call to mark their achievements. KUCHING: Athletes with disabilities and officials who guide them at Paralympic Sports Excellence Centre in Kampung Pandan in Kuala Lumpur are only to be given a token amount for pocket money because there is presently no incentives given by the state or nation. However, they accepted and understood the present situation that their stint at any national tournament was to gauge their potentials. “They know that they will get the incentives when they represent Sarawak in the biennial National Paralympic Games or when they play for the country and win medals,” said Minister for Community Wellbeing, Woman, Family and Early Childhood Development Dato Sri Fatimah Abdullah when contacted today. One coach and ten athletes were stationed at the centre from March 22 to 25. Fatimah said these athletes are in fact very motivated to carry on with sports. “They feel capable to compete and sports bring them health, exposure to more experiences and a way to livelihood with the attractive incentives,” she stressed. 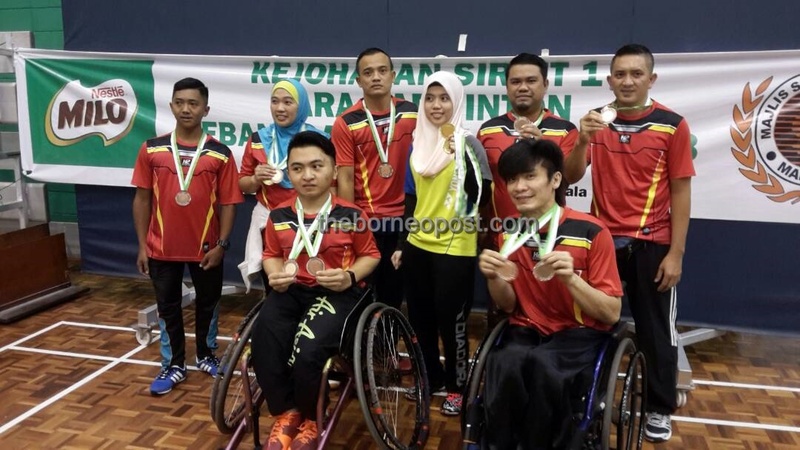 The Sarawak athletes gave a splendid performance in badminton when they obtained two gold medals, one silver medal and six bronze medals in the Circuit 1 para Badminton of the Malaysian Sports Meet 2018 held at the centre in Kuala Lumpur. The medals were secured by Nabilah Ahmat Sharif, Nursyazwani Shahrom, Chung Hong Hsin, Ashley Irenaeus Jack, Nik Ariffin Putit, Aziz Mulana Mohamad Daud, Hazery Sarbini and Mohd Aqilhazia Nong Chee. “I am happy to note that newly discovered talents like Ashley from SMK Dalat had made a lot of progress and contributed medals to the Sarawak Para team,” said Fatimah who is Dalat assemblywoman. Apart from Mukah, the other state para badminton athletes are from Kuching, Sibu, Kota Samarahan and Simunjan.